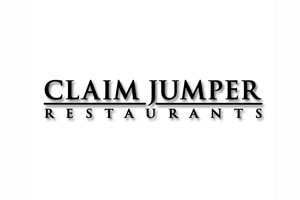 Claim Jumper Restaurants are popular with a large audience including families, children, seniors and business professionals. Our friendly environment is ideal for celebrating special occasions, hosting a business lunch or gathering for a delicious meal with friends and family. Open daily for lunch and dinner, Claim Jumper offers a selection of freshly prepared items using only the finest ingredients available. Favorites include Certified Angus Beef® and USDA Choice steaks, fresh fish, rotisserie chicken, baby back pork ribs, fresh baked pot pies, specialty salads, wood-fired pizzas, pasta, sandwiches, burgers and more. Claim Jumper's baked goods and desserts including our Six-Layer Chocolate Motherlode Cake, I Declair, Scratch Carrot Cake, Jumper’s Mud Pie and deliciously rich cream cheese pies are popular favorites with our guests.